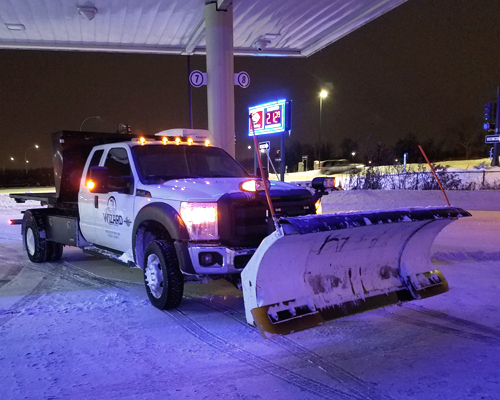 Wizard Snow Removal provides professional ice control, snow plowing, and sidewalk clearing services to residential, commercial, and multi-dwelling properties in the Northwest Twin Cities Metro area. Interested in joining our team? Learn more on our employment page! We service your property as quickly as possible regardless of time of day or day of week. This ensures safe access to the property and prevents hard-packed snow and ice from forming. Truck-mounted computers, smartphones, and tablets allow us to keep up with changing weather conditions and enable the customer to “keep tabs” on their properties via our online database. New and well-maintained equipment minimizes delays due to breakdowns. Wizard Snow Removal performs snow plowing operations for a wide variety of customers, from Grandma’s house to large commercial establishments. While we’re well equipped to handle large sites, our specialty is small and medium sized commercial and multi-dwelling properties where timely service and high quality work are important. Examples of the property types we service. Retail stores, strip malls, automotive service stations, hardware stores, etc. Warehouses, storage facilities, shipping terminals, industrial, etc. We operate only the most efficient and safest equipment, including snowplows equipped with down pressure for scraping hardpack snow, expanding plows with flexible wings to better windrow snow away from cars, buildings, etc., and vehicles equipped with the latest in safety equipment technology. We employ only the best equipment operators, most with over 10 years of winter services experience. Wizard Snow Removal offers flexible contract terms and seasonal, monthly, or per-time pricing. We mark every property we service with aesthetic polyurethane damage-free markers to prevent snowplow damage to your property (no unsightly wood stakes or irrigation flags). Every snow plowing customer receives free follow-up visits after each snow event to ensure the property is clear of snow and ice, including plowing the entrances (after city plows have gone by) and parking spaces previously occupied during plowing service. We service properties as quickly as possible during and after the storm in combating ice in the current weather situation. Our de-icing equipment uses the latest technology, similar to that used by MNDOT, to start ice melting faster. Wizard Snow Removal is equipped to handle every variety of ice and snow problem mother nature can throw at us. We utilize a variety of methods and deicing chemicals to manage accumulations of hard-packed snow and ice to ensure the safest possible conditions on your property. While many contractors spread salt, salt, and more salt, we realize that there is no “one size fits all” in ice control. Our policy is to service properties as quickly as possible after the storm, regardless of the time of day or day of week. We take this proactive approach, because all too often, Minnesota snow storms are followed by bitter cold temperatures, and the sooner your property is serviced, the sooner safe conditions can be achieved. We employ a variety of dry and liquid ice control products for asphalt driving surfaces. We use magnesium chloride liquid with corrosion inhibitors on nearly every ice control application, by either spraying it directly onto rock salt as it is being spread from truck mounted spreaders, or using pre-treated product such as Cargill Clearlane. This results in rock salt that is more likely to “stick” to the surface instead of bouncing off or being scattered by vehicles, and starts the process of disolving the rock salt immediately, and creating the brine solution that does the melting. We also have unique equipment that allows us to mix varying ratios of products as they’re being applied to increase effectiveness in cold temperatures. For sidewalk applications, we mix our own dry products to ensure quality and effectiveness, dependant upon property requirements and weather conditions. Our experience has shown that most pre-mixed bagged products do not represent a good value for our customers, we therefore mix our own products to ensure the most effective ice melter at a reasonable cost. We also employ treated salt products such as Cargill Clearlane and Magic-Salt to ensure safe conditions in cold temperatures. Wizard Snow Removal does not typically spread sand. Sand is however still fairly common amongst local contractors due to it’s low cost. Sand does not melt ice, the chemicals mixed into it (typically sodium or calcium) do the melting, but are typically at such low ratios, the chemicals aren’t very effective. Due to this, contractors often over-apply. Sand is “pushed into” the ice and hardpack by vehicles traveling over it, reducing it’s effectiveness. Sand tracks easily into buildings, causing increased flooring wear, increased interior cleaning costs and higher maintenance costs. Sand is difficult to remove from turf grasses in the spring and often causes turf damage. After the snow and ice has melted, the residual sand can be quite slippery for pedestrians. Sand must be swept up in the spring, increasing property maintenance costs. In the vast majority of icing scenarios, slippery conditions can be prevented and/or removed through the use of deicing chemicals and mechanical removal. Sand is typically only required for temporaty traction when extremely cold temperatures are present for an extended amount of time. We clear your sidewalks by hand shoveling, snow blowers, and small equipment, ensuring they are cleared to the edges. Sidewalks are cleaner, they look better, and you have use of the full-width of the sidewalk. This also increases safety and reduces property owner liability by reducing snow-melt running across the sidewalk and re-freezing. Wizard Snow Removal employs top shelf sidewalk crews that take pride in their work. We gladly perform the sidewalk work many companies shy away from. Our sidewalk crews are the best at what they do, and their work speaks for itself. When our crews use snow blowers or small equipment to clear sidewalks, they also take the time to go back over sidewalks with a shovel to ensure they are completely clear of snow. Sidewalk crews clear sidewalks to every edge, every time, preventing snow melt from running across the sidewalk and refreezing, further reducing the property owner’s liability. Our crews are fully trained in the various modern deicing techniques and chemicals, applying only as much product as is necessary, reducing tracking and unsightly turf damage come springtime. Chemicals appropriate to weather conditions are applied to ensure complete melting of snow and ice, preventing refreeze, and providing safe walking surfaces. Wizard snow removal also provides flexible sidewalk services that meet our customers specific needs. Many customers will chose a budget-minded level of service, handling shoveling and salting themselves up to 1″. Others choose a higher level of service, where we visit the property for any amount of precipitation to ensure safe conditions. Sidewalk services of any level are available regardless of the level of service required on driving surfaces.